The Gift Saga Trilogy is now in a complete set. 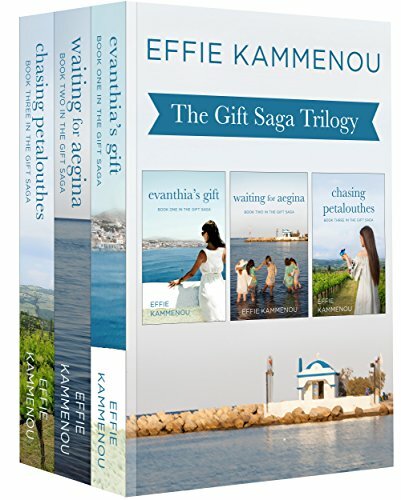 Three books: Evanthia's Gift; Waiting For Aegina; Chasing Petalouthes. In the year 1956, Anastacia finds herself pregnant and betrayed, fleeing from a bad marriage. With the love and support of her dear friends, Ana is able to face the challenges of single motherhood. Left with emotional wounds, she resists her growing affection for Alexandros, an old acquaintance. But his persistence and unconditional love for Ana and her child, Sophia, is eventually rewarded and his love is returned. In a misguided, but well-intentioned effort to protect the ones they love, both Ana and Alex keep secrets - ones that could threaten the delicate balance of their family. The story continues in the 1970’s as Sophia attempts to negotiate between two cultures. Now Greek-American teenagers, Sophia and Dean, the boy with who she’s shared a special connection since childhood, become lovers. Sophia is shattered when Dean rebels against the pressure his father places on him to uphold his Greek heritage and hides his feelings for her. When he pulls away from his family, culture and ultimately his love for her, Sophia is left with no choice but to find a life different from the one she’d hoped for. The Gift Saga concludes with the next generation coming into the forefront of the story during their tumultuous years between adolescence and adulthood. Over-achieving, focused, talented, determined to succeed. Those are the traits Stella envies in her siblings and cousins. Her insecurities and lack of confidence stunts her ability to realize her own worth. When an older, handsome young man claims her as his own, Stella believes she has finally found who she has been looking for—someone to love her enough to mold her into the best version of herself. But has she fallen in love too quickly for a man she barely knows anything about? Chasing Petalouthes (Chasing Butterflies) is the coming of age story of two flawed, young women who push their way out from the confines of the cocoons they’d built around themselves and discover how to soar. The Gift Saga is an homage to family, tradition, heritage, perseverance, and everlasting love in all its many forms. Love—unbinding, unbreakable, undeniable—love is eternal.